If there's one lesson I keep having to reminding myself time and time again is that you simply can't please everyone. Like the famous scene in Anchorman sometimes you just have to agree to disagree. Even on subjects far less contentious than the meaning of San Diego. Like for instance, in the weekend I had a discussion with my husband about the definition of "ice block". For me an ice block is any frozen dessert in the shape of a block on a stick. C reckons if it's made of dairy then it's an ice cream regardless of whether it's on a stick or not. But "ice block" is descriptive, I implored. It's about substance, C counters. For the sake of an harmonious marriage we agreed to disagree. 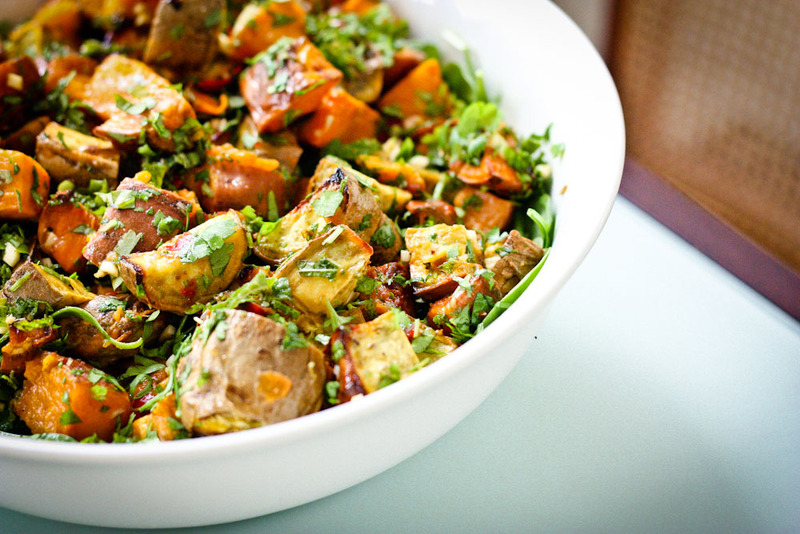 Which brings me to this pot-luck-fav of a recipe: Kumara Salad with Coriander Lime Dressing. While the rest of the world calls these delectably sugary root veges "Sweet Potatoes", in New Zealand they're known by their Maori name Kumara. Which, in my humble opinion, is an altogether sexier name. I first had this zesty summery salad last year. My sister in law found the recipe in a waiting room magazine, surreptitiously *cough* borrowed it and made it for a family gathering. Or was it Christmas? I forget. But what wasn't at all forgettable was the deliciousness of this fantabulous salad. It was fresh and vibrant, with beautiful colours, and a perfect balance of tangy, spicy, herby, and sweet. A thai-inspired masterpiece of a salad. Jane was kind enough to share the recipe with me and I could not believe my eyes when I saw it. It can't be that easy surely I thought. You know what though, it was. In fact, the hardest part of the recipe is cutting up the kumara. Heck, the oven does more work than you do, so it's a perfect recipe for couch potatoes. I'd imagine other roastable vegetables like pumpkin or beetroot would go beautifully in this as well but it's pretty perfect with just the kumara and so darn quick to whip up with the one type of vege, I haven't been tempted to deviate with recipe variations yet. I have made this for a couple of potlucks/bbqs now and people always ask for the recipe. It's that good. So whether I say potaYto or you say potaHto, everyone will love this hot potato of a salad. You could say, it's a recipe that appeels to the masses. 1. Preheat the oven to 200oC. Wash the kumara and cut off each end and discard. Cut the kumara into 4 cm cubes leaving the skins on. 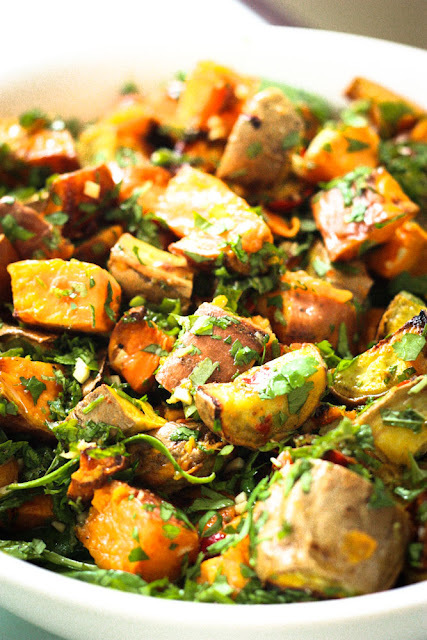 Toss the kumara in the olive oil and salt and roast in the oven for around 40 minutes. 2. 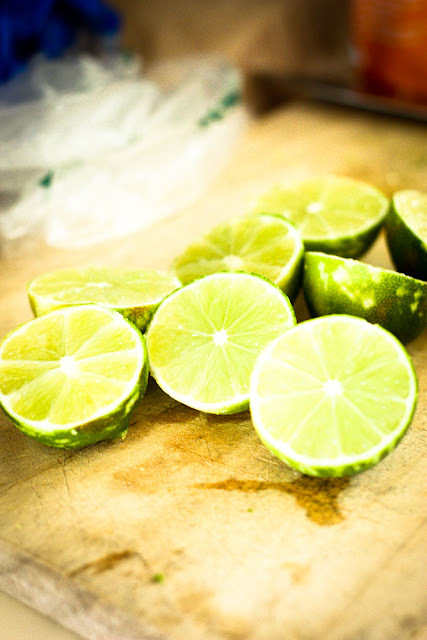 Mix the garlic, lime juice and zest, sugar, soy, fish sauce, peanut oil, sesame oil, chilli and salt and pepper in a small bowl. 3. Serve kumara hot or cold by placing on a serving platter. Drizzle the lime dressing over. The kumara can be roasted the day before serving and the dressing a week before serving. Just before serving, toss through the mint and coriander. mm sounds great! i love finding new recipes for sweet potato/kumara, as i often wonder what to do with it, it's so much harder than regular potato! Oooh this looks like a great recipe to have up your sleeve. 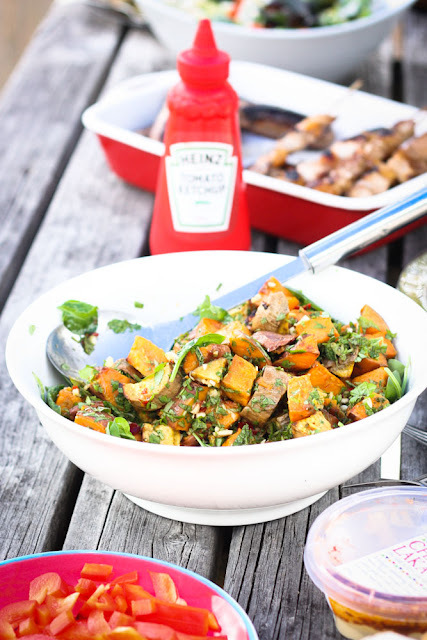 I love kumara so much (potatoes are boring :P), and that dressing sounds amazingly tasty! In Fiji they call sweet potatoes "kumala" and their "ice blocks" include ones with dairy. This recipe sounds like a good cold-weather alternative to Thai green papaya salad, I'll definitely be giving it a try! paula @ podandthreepeas: ooooo yams how exotic! I'm pretty sure they'd be awesome in this too - I've def gonna try out with some pumpkin. Yum yum.! Katie: I rate kumara sooooo much higher than run of the mill tatters! Just so sweet and tasty and with more vitamins. Linno: Potatoes are soooo the boring cousin - Kumara all the way I say. The thing I love about this recipe as well is that it is just. so. easy. Wins all round! 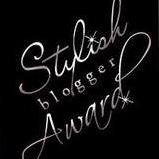 I made this last night as I have had it marked for ages on my reader. OMG it is so delicious. The dressing would be good with any (well maybe not any but lots) of different vegetables. Yum yum yum I'll make this again....funny as I have every single Taste mag but just goes to show how easy it is to miss a good recipe! 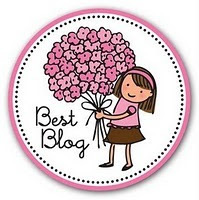 Hi I like your blog and wanted to invite you to join a new direcetorio www.recipebyday.com blogging recipes where you just have to register your blog and appear links to your recipes for you to increase your visits. Regards and Thanks. If you have any questions you can contact me.